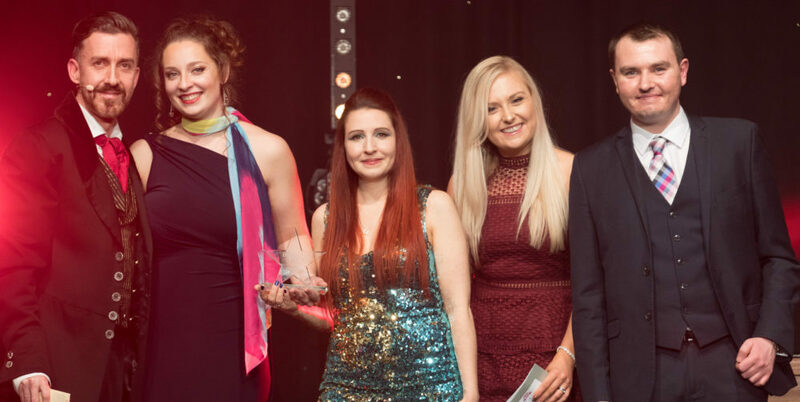 Congratulations to everyone at Hologic, who won the Employee Engagement Award, sponsored by Manchester Building Society, at our Birthday Party on 9th February. The Employee Engagement Award is in recognition of an employer that has encouraged and engaged with its staff positively to contribute to Forever Manchester and local communities; enhancing employee opportunities by raising funds, donating time and resources, and helping to raise awareness of Forever Manchester. The award was presented by Joanne Johnson and Sean McMahon of Manchester Building Society. Hologic is an international medical equipment testing and manufacturing company. For more than 30 years, they’ve pushed the boundaries of science to deliver clearer images, simpler surgical procedures, and more efficient diagnostic solutions. They pursue ‘The Science of Sure’ to enable healthier lives – everywhere, every day. Their UK office, based in Wythenshawe, has supported us for the last three years. Although they are a relatively small team in Wythenshawe, they have a formal charity committee and set themselves fundraising targets, and have come up with their own fundraising ideas as well as taking part in ours. Their company always matches the amount their staff raise and so far they have raised over £7,000 for Forever Manchester. Congratulations Hologic and their staff from everyone here at Forever Manchester!